Ongoing deal, never expires. Last validated 1mo ago . Used 22 times. Hannanah Mobashir Add coupon code SP15DS while checking out. 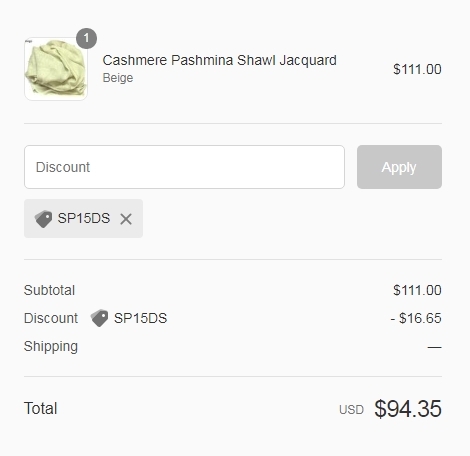 Darrin Alexander Mijares Clemente I am validating that this deal works as described with Promo Code "SP15DS" Get 15% on All Products at Spencer's Pashmina (Site-Wide). Hector Luis Figueroa This coupon is active and works as described, you simply have to enter this code in the box to apply the discount. Some exclusions may apply to this deal.